Hot tubs are at their most compelling in the winter time, but most of the new inflatable hot tubs are not designed to be used in winter! We have put together this guide to help make your inflatable spa use stretch to as much of the year as possible and will show you how to use an inflatable hot tub in winter cold. Additionally, this hack will let you heat your spa much more quickly, and more cheaply, than before! None of the manufacturers recommend this hack, so follow this guide at your own risk. Rudimentary plumbing and electrical skills are required, and we encourage those who are concerned to contact a professional. There’s a certain magic to stepping out on a cold winter’s day, with the snow around, and slipping into a bubbling spa filled with soothing hot water. Seeing your breath when you exhale mingling with the steam coming off of the tub is beautiful, and it feels so nice on weary limbs. But, most inflatable spas (as well as plug and play hot tubs) made by companies like Lay Z Spa, Intex, SaluSpa, and Coleman are not designed to work in the winter cold. Virtually all of the common models have a caveat in their instructions stating that they are not to be used when the temperature is below 40′ F.
That’s not even freezing, and if you follow the instructions to the letter, many who live in colder climates will not be able to use their inflatable spa for the portion of the year when it is the most rewarding. Many ask the question: can you use your inflatable spa in winter? The answer is Yes! We note that none of the manufacturers recommend this hack, so follow this guide at your own risk! Some rudimentary plumbing and electrical skills are required to assemble these items. If you’re unfamiliar with basic wiring and plumbing, contact a professional. Once assembled, however, as you will see, there is little risk of damage that can be done to your spa if this guide is followed properly. The main issue of concern is the motor mechanism, not the tub’s materials or insulation. These units are not designed to be run in the deep cold, and the motor could be damaged if it is run in cold temperatures. The water in the tub will stay warm (at or near 104′, generally) if the spa is left covered, but the spa makers suggest packing up the spa when the cold comes. In the vast majority of units sold on the market today by companies like Intex, LayZSpa, etc., the motor unit runs all the functions, but cannot accomplish multiple tasks simultaneously. For example, the blower that inflates the tub is the same blower that supplies the bubbles, and also circulates the water and heats it up. In the majority of units, the heater cannot run at the same time the bubbles are being expelled. This design helps to keep costs down, and allows inflatable hot tubs to be inexpensive. In times of cold, this creates a problem: when you take off the hot tub cover off the spa, it will start to cool down pretty rapidly. And you cannot run the heater and the bubble massage jets simultaneously: it’s one or the other. So you run the bubble jets to keep the tub going, but after a short while, it starts to feel more like bath water than a hot tub. So what can a creative inflatable spa owner do to combat this issue? We have some suggestions that will enable you to keep your inflatable spa running, even when it’s cold. Additionally, this hack will also allow you to heat your tub faster, and for much less cost, than the usual system! There are a few items you’ll need for this project. The first item we’ll need is 1″ foam core board insulation. It typically looks something like what is shown here and comes in a variety of sizes. You can find it at your nearest home improvement store. Most likely you will need at least two sheets, depending on the size of your tub. Find the radius of your tub. If you recall from math class, that’s the distance from the edge of the tub to the center. You can measure across the spa at its widest point and then divide by two, or just look up the specs of your spa and you’ll find the size. Once you have the radius, you can see how many foam boards you need. They are usually 4’x8′ or 4’x4′. Make sure you have enough to form a complete base around the tub. We suggest the EcoTemp L5 Portable Tankless Water Heater/Outdoor Shower as a heating source. Since you cannot use the default heating mechanism and blower jet mechanism at the same time, supplementing with a second heating system will supply a good deal more heat! This system will also likely also be a good deal cheaper than the regular heater on the pump, depending on the price of electricity in your area, and the price of propane. The Ecotemp will also heat up your tub significantly faster as well. The Flojet Automatic Water System 2.9 GPM 12 v DC works pretty well to move your water around. It will pull cold water out of your hot tub, and push hot water back in. This water pump is fine, but other pumps of approximately the same strength will work as well. The Kastar LCD AC Adapter 12V 6A with 3-Prong Power Cord Power Supply works to power your water pump through a regular AC outlet. Other, similarly-designed converters are fine too. 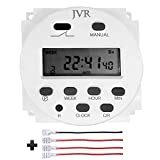 This JVR Timer Switch allows you to wire the pump connection to the AC Adapter, and also to automate the system somewhat, should you desire to. This portion of the project does require some wiring knowledge, and we caution those that don’t know much about wiring here. Below we link to a video explaining this step, though the context is different. However, if you are uncomfortable with the wiring, we encourage you to contact a professional or abandon this project. You’ll want about 20′ of 1/2″ internal diameter hose to connect to the pump. If you have a spare garden hose, you could use that, though you will need an adapter to tie the garden hose to the pump. If you want to get your own hose, grab a length of 1/2″ ID hose, and cut it in two. You should then tie that hose in with the pump. Getting clear hose is not required, and you may well have spare garden hose around, so you can use that if you like and skip these. If you use a hose that you have, be sure to grab the appropriate adapter. A standard 20 Gal Propane Tank is needed for the hot tub propane heater design. You can find these at any hardware store, many grocery stores, and most home improvement stores in the area. They are the same ones used for propane gas grills. You may need an extra propane tank hose if you don’t have a spare from a grill or fire pit. We like the Garden Treasures Steel Propane Tank Table Hideaway Cover. And technically you don’t even really need one if you don’t mind looking at the propane tank, but the cover certainly cleans up the look of the system. 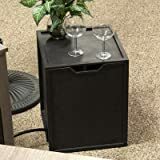 The box just makes things look a little bit more fit and trim, and it adds an additional spa side table if you need one. Most of the inflatable hot tubs on the market already come with an insulating barrier that separates the tub from the ground. It’s usually a disk or mat that sits between the ground and the spa and creates a thermal barrier between the two. However, this barrier is not capable of dealing with cold temperatures, so the first step is to beef up that barrier. You want to make your foam board insulating base just the size of your spa, or just a little bigger. An easy way to cut a proper circle is to press a nail into the board and tie a string or some fishing line to the nail, approximately the radius of the spa. Make the string taut, and use a razor knife or Xacto-knife to cut the foam insulation in a nice circle. You may need two sheets of insulation, depending on the size of your tub. If so, you can tape the insulation together with duck tape. This is much easier to do if your spa is empty, so you may want to get this done when you’re replacing your water, anyway. Put ground contact mat down, and then place the insulation on the mat. Place the spa on top of the insulating board, and now you’ve got a pretty solid thermal barrier that will help keep the spa warm as the cold comes. Place the propane tank inside the housing, and run the hose to the Ecotank L5 tankless water heater. For a clean look, you can attach the Ecotank L5 to the exterior of the propane tank housing. Attach the pump to the Ecotank, and attach the two hose lengths (you may need hose clamps). Place both hose lengths in the spa. As the pump runs, the water will circulate through the Ecotank and will be heated up quickly and inexpensively by the Ecotank. This step is somewhat complicated. You can view the wiring instructions here. This video goes in detail explaining the steps required to properly wire the switch, though the use case in the wiring video is not for a hot tub system. We caution those that are unfamiliar with the wiring on this step. If you’re concerned, contact a professional, or abandon this project. 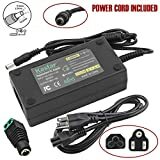 Connect the Kastar 12v to AC adapter to the pump so that the pump is powered by the plug-in adapter. Once you have the whole thing powered by a plug-in unit, you’re good to go! In some ways, the above system is susceptible to the same temperature issues as the main heater for the inflatable hot tub. If it gets very cold while the system is off, any water left inside the hose and pump could freeze and could damage the heater system. Obviously, we don’t want that! There are a couple of ways to combat this issue. The easiest one is to simply empty out all water from the system after using it, before storage. This way, any cold snaps will not harm the system, and once the freezing period is over, you can continue to use as normal. You could also keep the pump running with the heater on the Ecotemp off, and turn on the heater on the spa. This will ensure that warm water is running through the system without running the full propane heater for hours on end. Rejuvenation in the Spa, even if its cold! Once you have this system up and running, you can use the Ecotank to heat your water even when the temperature is under 40′, and you can also use the blower bubble mechanism at the same time as the Ecotank, so you won’t lose heat as the bubbles bubble. Remember to drain the system if freezing temperatures are imminent (or keep warm water flowing). If you want to keep a good eye on the temperature and weather conditions, you may want to check out a wireless weather station like the AcuRite Wireless Weather Station. Additionally, this heating system is much more energy efficient and much faster than the electrical systems found in most inflatable spas! Water will heat up 2-3′ per minute (as opposed to per hour), and heating costs are much lower with propane, though how much depends on your local environment and the cost of electricity in your area. Again, we caution those unfamiliar with basic wiring and plumbing in this project. Be sure to watch the videos linked above to see what will be required in terms of wiring. If you haven’t yet purchased an inflatable hot tub, please check out our inflatable hot tub reviews here. Good luck, and happy heating! I have updated the post reflecting an item I forgot to add. Additionally, I included links to a couple of videos explaining the wiring steps required to get it all hooked up. Good luck! After seeing all of that stuff to buy, it’s cheaper to build a small shelter for the hot tub and heat it with a pot-belly stove. 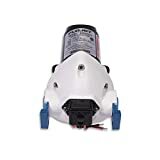 Why do you recommend a 1″ hose if the pump has a 1/2″ connector? Good catch, thank you. Fixed now. I’ve been looking to do something similar with my inflatable spa but one concern with the cheaper portable shower heaters is that they all advertise a 20-minute shutoff. How does this work for your setup? Is there a way to disable the automatic shutoff? In my experience the 20 minute shut off hasn’t been too big of a deal once its up to temperature. The shutoff cannot be disabled (it’s a safety feature). But if you’re running into problems with it, you can use a 24 hour mechanical outlet timer on your pump, set to 30 minute intervals so that your pump cycles on and off. That will reset the shower heater’s 20 minute shutoff every cycle. Thank you so much for this! I’ve just finished putting everything together an am ready to go install it outside. It really wasn’t too complicated. I built a surround at the same time I implemented these updates and the surround was quite a bit more expensive. While the surround was initially for looks, it is also serving as an enclosure for the propane tank and control unit, and as a mount for the heater and pump. I couldn’t have done the modifications without this guide. I live in Minnesota and am looking to use an inflatable hot tub in the winter. The Intex Purespa Jet and Bubble Deluxe allows two blowers to run simultaneously. 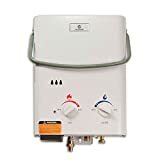 With that said, and as it relates to the backup heat source; Would it still be a good idea to use the tankless water heater while in use, to save on the tub’s heater? We were hoping to be able keep the tub heater running at a low temp, and blast it with the tankless system prior to and during use. Temps here can dip way below zero, so we’re trying to find the best way to heat it without going broke paying our electric bill. In addition to the back up heat source, we’re planning to put down a couple layers of insulation board, and use pipe insulators on the hoses. Would we need to wrap the tub filter/heater in something to protect it, as well? Any advice is appreciated – thanks! You would almost certainly want to protect the filter/heater in some sort of insulated enclosure, as if water freezes inside that system, it will damage the heater. The tankless system would certainly take pressure off of the heater, and will allow you to warm up the tub more quickly. Again, just be sure there’s no water in the system when you shut it off. Good information, have decided on the Intex inflatable hot tub. So not extreme cold weather but in the winter there will be days when it can drop below 40 and occasional days when it would go to freezing . Putting the insulated board under the spa is good idea and I can surely do that, but hooking up a propane heater and plumbing is more than I want to do . If I read your article correctly the danger is the water in the pump and the pipes freezing. Is there any reason why I can’t just leave the heater on 21/7 to avoid that issue, or disconnect the pump when the weather gets to freezing or below and just have inside in a warm environment and reconnect when the weather warms up ? I think you would be fine to simply run the pump during the times it briefly freezes to ensure that none of the water freezes up inside the heater or pump. Just stay on top of the weather, and if you do see that you’re going to have a prolonged cold spell, you may want to disconnect everything and empty it out. I agree, in your situation going with the propane system is unnecessary, unless you just like DIY projects!